Much of our journey through Ribera del Duero that day had been on local roads or minor highways, though a bit south of Burgos we joined with the busy A-1 highway that runs the north-south route to Madrid. The train from Madrid is doable in as little as two and a half hours, though there seem to be plans to add higher speed Ave train service in the near future. 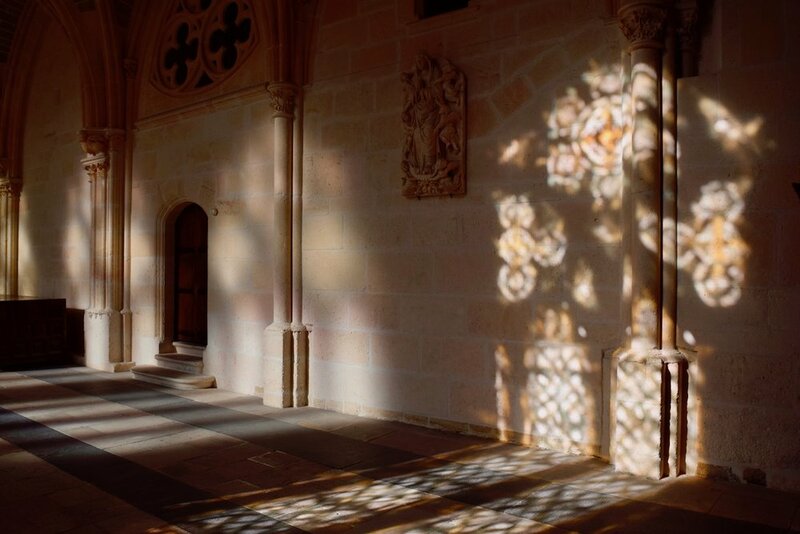 Geographically speaking, the city is situated in its namesake Burgos Province within the Autonomy of Castile and León, easy striking distance of the Ribera del Duero and Rioja wine regions. 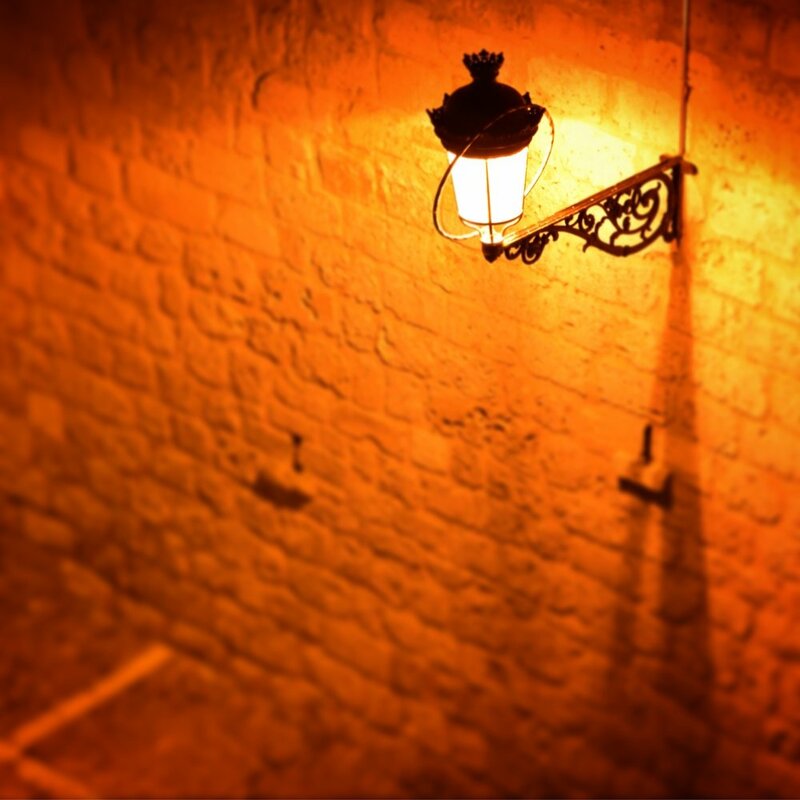 Our evening here centers on the Burgos Cathedral in the old city. Looking at a map, there is a half crescent running from the Burgos Cathedral and the Arco de Santa María to the Plaza de España, roughly along the axis of the streets Calle Paloma, Calle de Lain Calvo, and Calle de la Concordia. You'll find lively activity here, completely sufficient to pass your evening and day. Though walking in this part of town is a joy, the driving (and parking) experience is another matter entirely. I am almost certain that our Airbnb apartment was not directly accessible by car; though we found a way to do it anyway, the misadventure resulted in us getting stuck on the wrong side of a retractable post that had to be lowered via a callbox to an operator. My wife says it was in this moment that she realized that I speak decent enough Spanish to get by. I allow the distinct possibility that the operator felt the best way to deal with a foreigner babbling at the radio on the wrong side of a do not enter sign was just to let him leave. We parked in an authorized underground garage on the other side of the river. It is written of the Christianization of early Russia around the turn of the last millennia that Vladamir, Prince of Novgorod, chose to align with the Byzantine Orthodox church after his emmissaries reported of the Hagia Sophia in Constantinople that "We knew not whether we were in Heaven or on Earth… We only know that God dwells there among the people, and their service is fairer than the ceremonies of other nations." They had evidentally visited Catholic Europe, and were unimpressed. Burgos Cathedral would, of course, not be consecrated until nearly three hundred years later, a grand and glittering place in which I found myself wondering at every turn how history might have unfolded had this place been an available option for Vladamir's religious sightseeers. Alas. 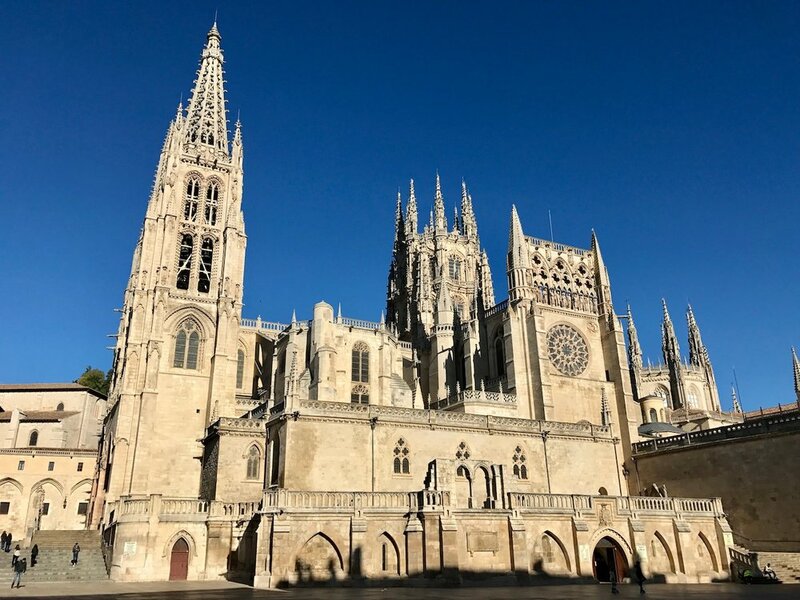 Though Meghan actually prefers the austerity of the cathedral in Valladolid, I was swept in by the grandeur of the Cathedral of Saint Mary of Burgos (Catedral de Santa María de Burgos). Consecrated in 1260, it is an enduring and extraordinarily well preserved testament to the particular architectural ingenuity of the High Middle Ages and early Renaissance... and the ostentatious fervency with which they honored their creator in stone and gold. I recommend a visit here after dark, crossing the Puente de Santa María bridge to enter the cathedral's square under the striking glow of the Arco de Santa María (she's a big deal here), and then again in the morning to explore any crevice that isn't roped off inside this magnificent church. Otherwise, the city's proximity to Ribera del Duero makes it about as well suited for basing your exploration of Ribera del Duero as is Valladolid, and certainly better positioned for an exploration of Rioja. We visited Bodegas Arrocal the day we arrived, and Bodegas Marqués de Tomares the day we left. Both excellent. You will find the restaurant La Favorita on Calle Avellanos walking up from the cathedral on Calle Paloma (which turns into Calle de Lain Calvo) and making a left at the end. We struggled on entering because this place is divided between a rather rowdy casual front of the house and a finer dining back of the house that was not immediately obvious to us. Make a reservation, and seek out one of the (at least on this night) very busy staff up front to get you where you need to be. We paired a deliciously prepared fish alongisde the Rosado de Silos, a Tempranillo rosado (rosé) from Ribera del Duero. There are, otherwise, enough restaurants along the street to have made us rather sad that we did not either plan a second evening in town or eschew reservations all together in favor of going with what we felt at the moment. There's no stress in dining here. We had another wonderful Airbnb experience here, in spite of our inability to reasonably get there by car. Concentrate your search around the cathedral, and if you have an apartment with catehdral view on Calle Llana de Afuera pop up, take it. The view is a real thing, particularly peaceful as the evening wound down sitting looking through the open balcony door out into an empty square with the cathedral walls rising not a stone throw away. We washed a load of clothes to dry overnight before hitting the road the next afternoon. I've visited enough cities at this point to feel confident in my return instinct. Some places fade into the distance a pleasant memory that requires no return, others tug at your psyche from the moment you start forlornly looking towards the exit. 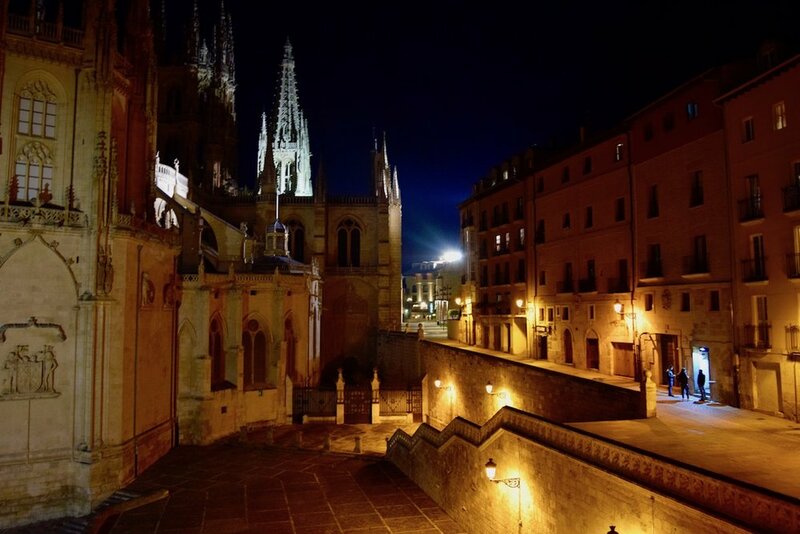 Burgos is the latter, a place of wonderful contrast of grand cathedral looming like the divine over the lively streets below... and much unexplored for which we must return.